Barbara K. Altmann, Ph.D., Named 16th President of Franklin & Marshall College. 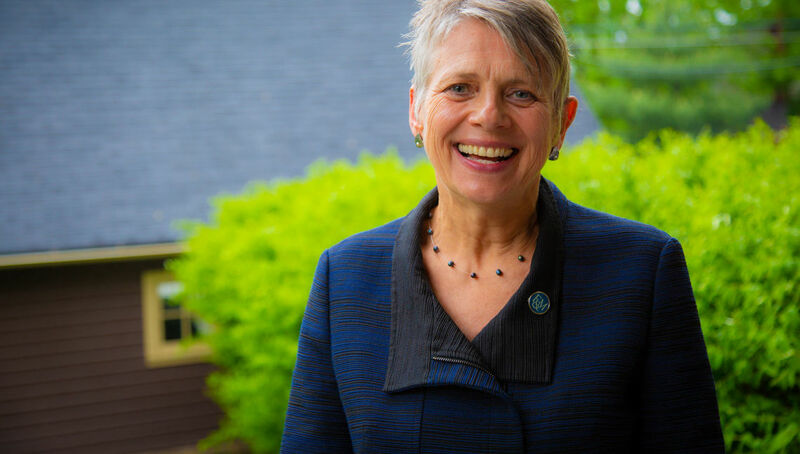 Lancaster, PA - Barbara K. Altmann, a scholar of French medieval language and literature and current provost of Bucknell University, has been named the 16th president of Franklin & Marshall College by unanimous vote of the Board of Trustees, announced Board Chair Susan L. Washburn ’73. Dr. Altmann will begin her duties in August. "Barbara Altmann is an exceptional teacher and scholar, a skilled and passionate advocate for the liberal arts and a leader of great depth who inspires the best in others," said Washburn. "At both a research university and a liberal arts college, she has demonstrated her gifts for nimble and creative thinking, strengthening connections across disciplines and building partnerships that work. Her deep understanding of the difference that an F&M education makes in the lives of students and the world they will shape captured our imaginations, and we are thrilled to welcome her to our very special community." Altmann joins a college that has been hailed for leading a "recruiting revolution" (Washington Post) for its innovations in meeting the changing needs of today's students. Through its talent strategy, F&M has implemented an array of programs to boost enrollment and success among stellar students from every background. It has dramatically expanded its admissions outreach nationwide to high schools often overlooked in college recruiting, established a signature College House system that integrates residential and academic life and developed a new model to support students' personal and professional development during and beyond college. Over the past seven years, F&M has nearly tripled its financial aid to each first-year class—to $16.9 million for the Class of 2021—while the proportion of students eligible for Pell Grants has increased from 5 percent to 24 percent and average SAT scores have continued to rise. The strategy has yielded tremendous outcomes for F&M students. Not only are 98 percent of its graduates employed or in graduate school within six months of graduation, F&M is a top producer of Fulbright winners and students have won the first Truman, Mitchell and Soros fellowships in school history. "As a child of immigrants and a first-generation college student myself, I am honored and inspired to join a college that so beautifully blends the very best traditions of the liberal arts with constant innovations that are preparing students for the fullness of possibility and success in the 21st century," Altmann said. "I am eager to push ahead with the national momentum that outgoing President Daniel Porterfield has built for broadening access to college for talented young people from all backgrounds. We want to attract the brightest, most motivated students from every corner of the country and around the world. An F&M education is a powerful springboard toward whatever opportunities they seek after college and throughout their lives." Co-founder and home of the Pennsylvania College Advising Corps, F&M has also built strong partnerships with leading K-12 schools and college-access organizations, including KIPP, the Posse Foundation, the Cooperman Scholars Program and College Match. Inspiring others with its talent strategy, F&M led the creation of a coalition of 100 colleges and universities nationwide in the American Talent Initiative, an initiative funded by the Bloomberg Philanthropies that seeks to dramatically increase by 50,000 the number of high-achieving, low- and moderate-income students in America's top institutions by 2025. "Barbara is going to make a phenomenal next president of the college," said Shakeyla Flores '18, who served on the search committee. "My conversations with her made me feel especially confident in her ability to engage with students and collaborate with us. Her attentive and naturally approachable demeanor cannot be taught, and I look forward to everyone at F&M experiencing her caring way of interacting with people." "It is a new president's dream to join Franklin & Marshall at this moment in its evolution," Altmann added. "The students are excellent and engaged and committed to learning, the faculty are wonderful teachers, scholars and artists who are constantly advancing pedagogy and the breadth of ideas, my predecessor has done extraordinary work advancing the strengths and reputation of the college, and every constituency, from alumni to parents to the array of outstanding partner organizations, is deeply devoted to it. I could not feel more fortunate, and I can't wait to get started." Altmann will take office as the college prepares to launch the public phase of its largest comprehensive campaign in October 2018. Among other priorities, the campaign is investing in new teaching and research initiatives, recruiting top student talent, increasing co-curricular support for student learning and well-being, improving the student-athlete experience and building the unrestricted Franklin & Marshall Fund, which provides flexibility to support every initiative. The campaign also has enabled F&M to continue developing its physical campus, building its new multi-purpose Shadek Stadium on a remediated brownfield site and recently breaking ground for the new Susan & Benjamin Winter Visual Arts Center designed by renowned architect Steven Holl. At Bucknell, Altmann has played an instrumental role in securing major gifts for programs, capital facilities and endowed faculty positions to support all divisions of the University. "I was struck by how, from her first administrative role, Barbara has found a way to deliver what her institution needed," said Associate Professor and Chair of Classics Gretchen Meyers, a member of the search committee and chair of the Faculty Council. "Time and again across her career, she has demonstrated creativity and expertise in seeing through problems and gathering the resources to make progress. I know she will be a catalyst for similar efforts at F&M that will affirm and strengthen the College's ability to lead." 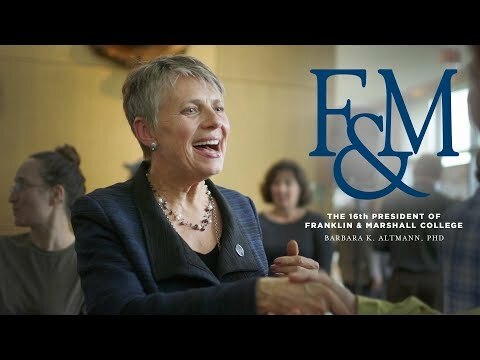 In the following videos, F&M's 16th president, Dr. Barbara K. Altmann, offers some of her perspectives on the character of the College, its national leadership on student access and opportunity, the importance of the liberal arts in the 21st century, the value of the student-athlete experience, and her excitement at joining the F&M community. "Franklin & Marshall is a great combination of the venerable and the contemporary..."
"There is a wonderful crackle of intellectual energy on campus..."
"As long as we keep our focus on the 'student' in 'student-athlete,' it is an incredibly enriching and important experience..."
"The liberal arts are always the core and the building blocks from which everything else arises…"
"There is so much that is going well at F&M…"
A sampling of welcome remarks and reflections from College trustees, presidential search committee members, students, faculty, staff and friends.